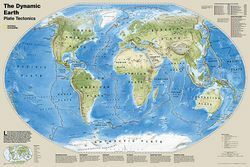 A tectonic world map done by National Geographic called "The Dynamic Earth." Physical world map featuring subduction zones, earthquakes, volcanoes, hot spots, spreading centers, and transform faults. A miniature inset on this tectonic map shows the 16 major plates worldwide.